God, can you help me? The words swirl in our thoughts when we find ourselves in a quandary, at times when the battle grows strong. Silence emanates from God’s side. And then the thought slips into our brain. Thank the Lord that we serve Him, a God who continues to deliver His people even today, a love-filled Father who helps His righteous amid their afflictions. Psalm 34:18 casts the picture clear. Many are the afflictions of the righteous. Yahweh delivers him out of them all. Looking to build your faith muscles? 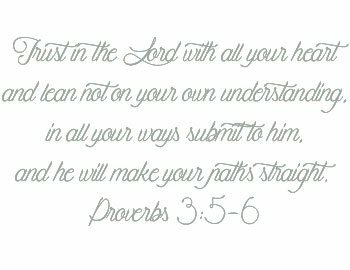 After reading today’s post and jumping into this month’s memory verse, check out this TRUST-related nugget. Crystal Storms published a piece of mine last week called 5 Powerful Action Steps When You Ask, “God, Where Are You?” That piece is a perfect match for our memory verse this week. Don’t miss it. Also, Crystal blessed us with a guest post here last Tuesday. Her piece, When God Doesn’t Answer Your Prayers in the Way You Hoped was powerful. Make certain you don’t miss it. And it’s A-OK to spread its encouraging message by sharing on social media or in an email. In this day and age, words, actions, and ideals splatter all over us from a wide range of sources, all attempting to paint our identity. But what about the Bible? What about God and His truth? Silencing Insecurity pulls from God’s Word and plain ‘ol wisdom to encourage readers in their search or reassurance of identity. This book resembles a breath of fresh air, the aroma of Christ spoken from a friendly source. I don’t know Donna personally, but I feel as though we’re friends–in a Christian, professional way–after reading this book. She doesn’t wag a finger or stand on a podium. 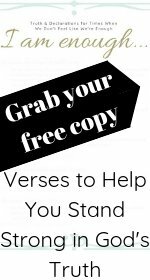 Her writing comes alongside as a friend and counselor, offering solid, strong suggestions and encouragement from the Bible. The author identifies thieves many of us face in our search for “who we are.” She helps throw off their cover, exposing them in the light of God’s Truth. I nodded my head during several of the chapters. Donna dives into various problems we may face such as mental, emotional, or relational issues. She brings real life to the pages and helps readers understand what they are facing and why. Then comes the most important part. Donna leads us toward conversation surrounding transformation and freedom with our Father. Her words leads us to the throne of the Almighty and His truth. Is it a book I’d pull out the highlight for? Indeed. Is this a book I’d buy for a friend? Absolutely! Consider grabbing a copy of Silencing Insecurity if the tumultous world of identity is rocking your boat, if you love refreshers every now and then of God’s truth, or if you simply enjoy new reads. Pure sweetness, a swelling of the happy kind–that’s what this read offers. Although it’s a-typical for the type of books we read and review here at KristiWoods.net, this one deserved a chance, just like its subject-matter. I’m on the dog bandwagon right now. I love rescues and their heart-warming stories. After all, my family and I just adopted (at our best guess) a collie/terrier mix. A few days after Ellie joined our family, another rescue sprinted into the picture–a Belgium Malinois named Kasey. Considering our house full of rescues, this book is appropriate. If you’re looking for stories that warm the heart, bring out one’s inner cheerleader, create a smile, even cause a tear, then grab a copy of this Revell publication. It’s appropriate for you, too. I fell in love with dog after dog, story after story. You might find yourself doing the same. This book would make a great Christmas gift for a friend or work acquaintance. Consider it also for your own nightstand table. The publisher supplied a free copy of Second-Chance DOGS and Silencing Insecurity in exchange for my honest review. Comment below for 1 entry. Gather 2 entries by subscribing to KristiWoods.net and letting me know in the comments below that you’ve done so.